At The DOMO Group, we do things a little bit differently than most Realtors. Our detailed analytic approach to real property valuation is what makes us pricing experts and sets us apart. Similar to an appraiser, we analyze each individual comp (comparable sale) and compare them to the "subject property." We breakdown every aspect of the property, from location and condition to lot size and view. Is the property a corner lot? Is the floorplan compromised in any way? We make adjustments according to what the current trends are in the present real estate market. The result is a range of "Adjusted Values." The average of the Adjusted Values is very close to the likely sales price of the property. 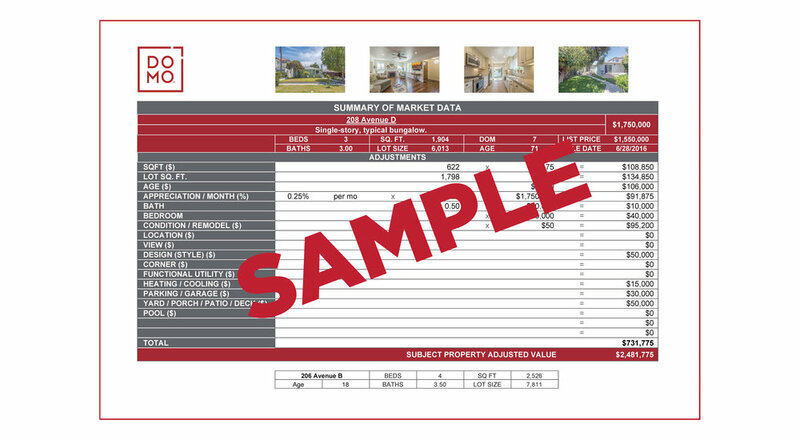 This Market Analysis is not only useful in determining the best pricing strategy for a property that is going to go on the market, but it is also a great tool when speaking with potential buyers about the seller's opinion of value. We've found that we're able have a more intelligent conversation with buyers and often get "buy-in" on better price and terms for the property. Thank you for your request. We will be in touch shortly.